Oh boy, the Apple iPad is really getting it. Just several days after being introduced to consumers by Apple head honcho Steve Jobs, the iPad has quickly become the recent favorite as a subject for tech jokes. It might be the norm for new gadgets and devices coming out nowadays. 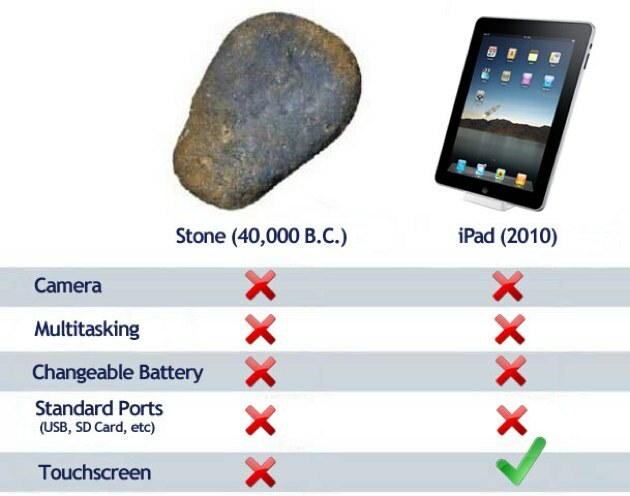 The above image is courtesy of Tech Crunch, giving just an example of how the iPad jokes keep on coming. The iPad jokes have even reached the recent Grammy Awards. Political punster Stephen Colbert whipped out his own iPad while announcing the nominees for Song of the Year at the 52nd Annual Grammy’s. Whether it is a subtle joke with some sarcasm added or simple a plain publicity joke, you be the judge. Engadget has a video of it that you can checkout. Who knows just when the same jokes would be doing the rounds on talk shows next. The iPad jokes going around still provides some publicity for Apple’s new baby, how hilarious they may be. But whether it will propel the new device to new heights in terms of consumer popularity would still remain doubtful. After all, nothing beats being compared to a rock.